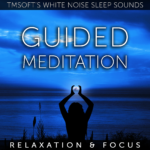 TMSOFT introduces Guided Meditation: Relaxation and Focus which is available today on Spotify, Apple Music, Google Play, and Amazon. A video version is available on Amazon Prime Video and YouTube. The 10 minute guided meditation is the perfect way to begin your day or to simply take a short break. The soothing voice takes you on a journey through sounds of nature, a body scan, and breathing exercises. Whether you are a beginner or advanced in the practice of meditation, it is easy to follow. Make meditation a part of your daily routine to take advantage of numerous benefits including positive thoughts, relaxation, focus, and better sleep. Meditation challenges us to let go of negative feelings like stress, worry, and anxiety. If you meditate daily you may notice negative feelings no longer clutter your mind. The moments of peace attained through meditation can instantly shift your mood from negative to positive. Meditation also helps us relax by compelling us to be in the moment. This means we are not thinking about the past or the future. We are not trying to figure things out. It is the most relaxing state you could ever imagine–no worries, no stress, just be. We recommend meditating daily to maintain the zen feeling achieved through meditation. Focus happens when you are feeling calm and relaxed. You are able to sit and work on a project more efficiently without anxiety, stress, or distractions. The ability to focus may also foster creativity, improve problem-solving skills, and enhance productivity. The strategies you learn and practice during meditation can improve your sleep. By allowing your body and mind to relax rather than think about the concerns of your day, you will fall asleep faster. If you find your mind racing at night you can quickly slip into a calming, relaxed state by tuning into the guided meditation. Focus on your breathing, be in the moment, and drift off to sleep peacefully. We’ve given you 4 great reasons why daily meditation can be beneficial. You can stream our guided meditation track on your favorite music service or for free on YouTube. Now it’s up to you to find 10 minutes in your day to become more relaxed and focused than ever before. We’d love to hear how meditating has improved your daily routine. Find us on Facebook and Twitter to let us know! This entry was posted in White Noise and tagged focus, guided meditation, meditation, relaxation. Bookmark the permalink.